Roses can create a living legacy connecting us to past generations. Let me tell you a love story of a rose called Seven Sisters and a beautiful family knit together today by a rose bush after six generations. It will make you wonder if a mother’s love cut short by tragedy can reach out tenderly across time distance and space to say “I love you” through a rose petal or the soft fragrance drifting in the early dawn. My Grandma (I called her “Mamie”) told me that when her grandfather, Joseph Lucien Wilson, first saw Susan Thomas Goodman, it was love at first sight. Sue was just 14 years-old and it was 1847. Sue’s grandfather would not give his consent for them to marry until she was almost 17 years-old. On 18 April in 1850, Joseph Wilson married his 16 year-old sweetheart, Sue Goodman, in 1833 in Kentucky just one day shy of her 17th birthday. One of their wedding gifts was the ‘Seven Sisters’ rose. Wherever they lived in their married life, this rose and its cuttings had a prominent place in their gardens. In their nearly 22 years of marriage, Joseph and Sue had nine beautiful children; and, in 1870, Sue was expecting their 10th child. When she was 8 months along with their tenth child, she attempted to walk across a log footbridge. Tragically, she fell. Both she and the little boy she was carrying died on 8 July 1870. Grandpa Wilson not only had nine children to feed, he had to pay taxes on his plantation. After the War Between the States, this wasn’t an easy thing to do. Mamie told me that her grandfather had no money and few assets and bet the plantation on a race horse named Kit – and lost it all. Fortunately, prior to this sad war, Grandpa Wilson had purchased three farms in Texas as a land speculator. My Great-Grandma Belle married at age 20 in 1877. When she married Samuel Dean Bunger, she took as a cutting of ‘Seven Sisters’ with her to her new home. By 1887, Texas and all of the Great Plains were hit by a severe drought that lasted until the late 1890s. But, in 1888, one of the miracles in my life was born in Graham, Texas: Grace Helen Bunger (“Mamie”). Along with her family, that ‘Seven Sisters’ rose would move from Graham, Texas to Noble, Oklahoma, back to Texas. 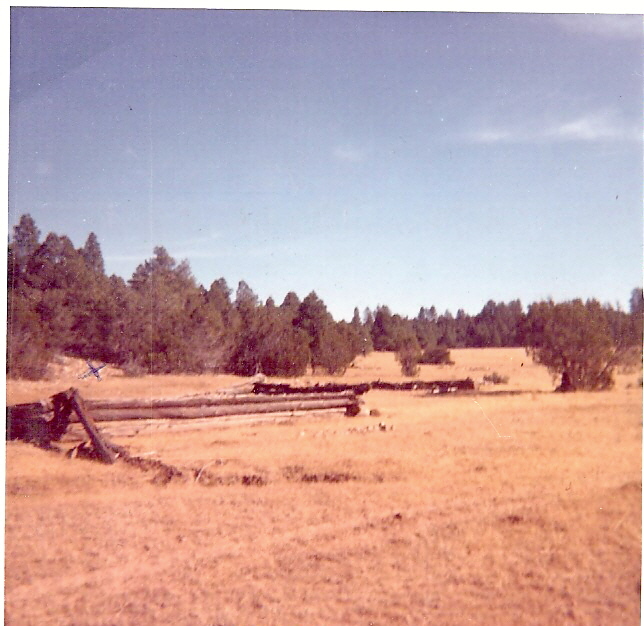 And, in about 1913, the Bungers moved to Northern Arizona, a territory that had been purchased from Mexico under the Treaty of Guadalupe Hidalgo in 1848. The family came by covered wagon and buckboard. There were trains, but the Bunger family didn’t have the money to ride them. But, guess what made the trip? Yes! The ‘Seven Sisters’ rose, or at least some cuttings from it, went to Heber, Arizona by wagon train and buckboard. A cowboy named Thacker Millard Turner followed the Bunger family to Heber, AZ and, in 1914, he married my grandmother. Thacker and Grace eventually built a beautiful log cabin on their L-X Ranch in Heber, AZ; but not before three children, including my mother Roberta Rose Turner, were born in a tent. Bad luck struck this young family and the beautiful log cabin burned and all that remained was this log fence outlining the property. It was sometime before 1920 when ‘Seven Sisters’ made her way to the Phoenix Valley and various home sites. She would eventually wind up on Apache Road in Phoenix where she lived until about 1950. Switching gears: my dad, a Marine Sergeant who’d served in the Pacific in World War II, met my mother, Roberta Rose Turner, at a dance in Phoenix. Two weeks later, they were married in El Centro, California. Now we’re talking! I’d be hatched in 1945! Times were tough after WWII. Housing was scarce and so was work. We moved around so much that my older brother Ken went to 21 different schools in the 3rd grade! One of the places we stayed for a while as my Dad did carpentry work was on my Grandma’s dairy farm in Ontario, California. My little brother Les was about 18 months, I was three and our older brother Ken was 9. We didn’t stay long because my dad wisely decided to return to Arizona State College (now ASU) in Tempe to earn his Bachelor of Arts and his teaching credential. 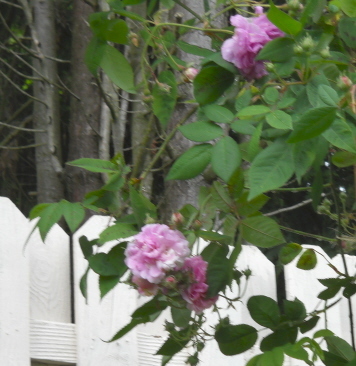 I didn’t know that the ‘Seven Sisters’ rose was on Mamie’s dairy farm, but it was there and growing! We lived in Tempe until my Dad graduated from Arizona State College and taught two years at a grade 1-8 country school in Maricopa, AZ. In the summer of 1953, we moved to Mamie’s dairy farm in Ontario, California and my life of crime as a plant rustler would begin. Of course, I was only 7 years old, so I was just an accomplice in these crimes. My grandma was now 65 – two years younger than I am today. Her son, my Uncle Jack, was on some forgotten hill in Korea. While she waited for his return, my 65 year-old grandmother built a beautiful 4-bedroom home with living room, dining room and kitchen. However, it was the landscaping of this home that would be my downfall. I was a TINY 7-year old weighing in at about 25 lbs. Mamie would take me on LONG walks in the country and we would ‘rustle’ plants. We are talking country miles here. Mamie always had her head covered (I still have her bonnet) and almost always wore an apron with two large pockets. With one exception, she ALWAYS wore a dress. On these walks, Mamie would “borrow” plants from the neighbors. She would walk by a plant she liked and deftly snap off a branch (snap). The branch would then go into her sweater, dress or apron pocket. On these forced hikes that might cover up to 10 miles (what else did I have to do on a hot Southern California summer day? ), she would literally fill her pockets with treasures from the plant world. Of course, roses were her favorite, but she was an equal opportunity rustler. Eventually, her home would be surrounded by the beautiful Bird of Paradise, irises of all sorts, pyracanthas (too pokey for me), and honeysuckle growing outside her kitchen window so when she washed her dishes at night, she could enjoy the faithful California evening breeze and the honeysuckle’s fragrance. When we got home from our criminal activities, Mamie would get a shovelful of the freshest cow pile she could find, dig a little hole, fill it with water, plop in the manure and stick in the plants one at a time just where she wanted them to grow. They ALWAYS grew! While Mamie was building her home, I lived with her in the little milk house. It was perfect for the two of us. My parents lived in the “big house”, but I got to sleep on my grandma’s feather bed and listen to what my family calls “old fashioned stories”. That is when I learned about the travels of ‘Seven Sisters’ and how she (the rose) had lived in at least 5 states up to then. 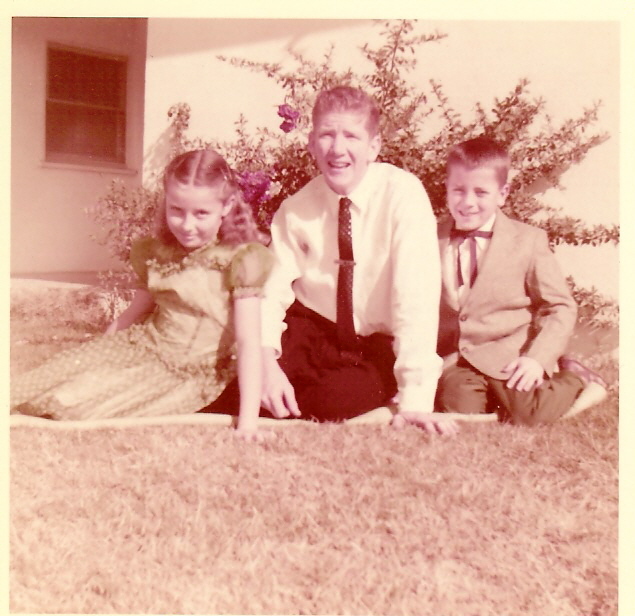 In the photo of my brothers and me—probably Easter Sunday 1952, you can see ‘Seven Sisters’ blooming behind my left ear. To the right of ‘Seven Sisters’ is a pokey pyracantha bush. 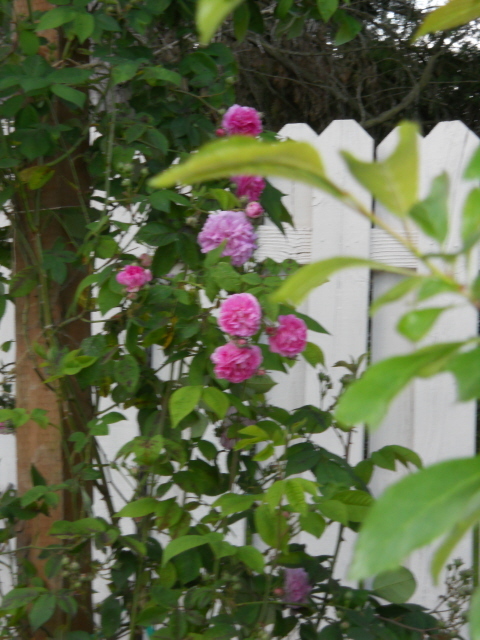 Mamie didn’t have the rose on a trellis. She just let it grow fat and sassy. I didn’t remember that it only bloomed once because when it bloomed, it was covered with countless deep pink fragrant roses for up to two months. 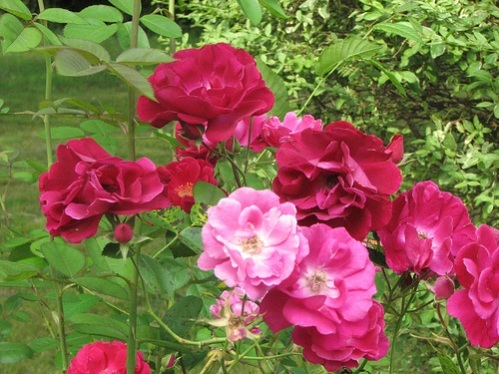 Best of all, there was Mamie’s rose garden—all of her flowers were in raised beds. 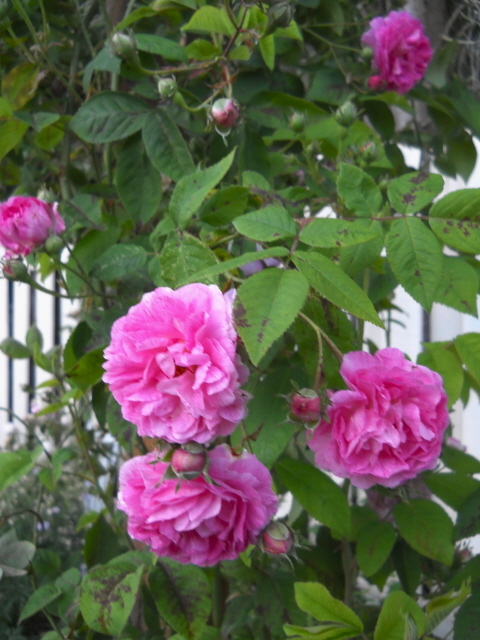 I remember a tall, pink rose that I now believe could have been a rustled ‘Queen Elizabeth’. It was so fragrant! I also remember what I now believe was ‘Charlotte Armstrong’ (also rustled). It was a paradise for a little girl who’d been part of bringing these roses to the farm. I don’t think my grandma ever purchased a plant, but she may have. Oh! The neighbors knew she was rustling plants. They all loved her—just like I did. Happily, my Uncle Jack came back safely from Korea; but, sadly, Mamie decided to move back to Phoenix where most of her family lived. She traded her dairy farm for a home in the South Mountains of Phoenix. My family bought a home in town and Mamie and her ‘Seven Sisters’ rose moved away. All was not lost! The very first thing my dad did when we moved into our home was to plant a rose garden! Ahhhh. Flowers. And, I won a contest where I was given scholarship money and a beautiful arrangement of roses! 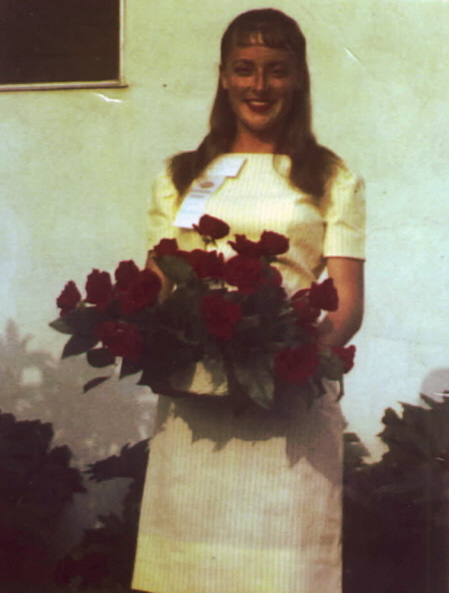 I was a future member of the American Rose Society, but it took me 47 years to find it! However, the story of the ‘Seven Sisters’ rose is not over. I have some of it growing in my backyard on an arbor. I think it’s about ten feet tall now. It already has buds on it! (If you don’t live in a place like Washington State, you might be thinking, “Big deal!”) However, to those of us in colder climes who see blooms in May, there is cause for celebration. Will my children grow a cutting from the ‘Seven Sisters’ rose that has traveled so far in the last 140 years? I don’t know. I hope so. I hope this story is no way near its end. I firmly believe introducing children to the plant world is a wonderful idea! I do know that I’m growing a cutting for my Cousin Susan Fox and I hope it will enjoy going back near where it came from. I wish I knew who gave that first cutting to Joseph and Sue Wilson for a wedding gift. I don’t think Mamie knew or she would have told me. With a rose loving family like mine who moved roses from state to state, how could I not love growing roses? What are your rose stories? Where have your roses traveled? Will you please share the stories and the adventures of your roses? It’s up to us to be their voice. They can’t tell us, you know. I d o not have any roses from my grandmother BUT I do have a house plant that has lived in 3 different states and 6 different homes. It is only about 60 plus years young and I hope has many more years left. What an amazing tribute to your green thumb! 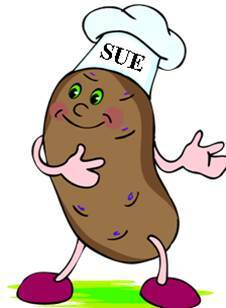 what a beautiful story Sue! Thank-you for your kind thoughts. Yes I had the rose Tiffany and its so true the thorns especially in Texas can be fairly sharp. Thank-you for your comments. 🙂 Its great to have a rose in your garden that shares your name.